Elizabeth of Hungary is drawn from Chapter Five, beginning on page 123, of Volume Seven, A Glorious Disaster of the twelve-volume historical series The Christians: Their First Two Thousand Years. If you would like to order this book please visit www.TheChristians.info. Even amidst the recurring darkness of the later crusades, some lights shone brightly–one of them in German Thuringia, where in 1211 a four-year-old girl was sent to be raised as the bride of Thuringia’s next ruler, then eleven. This little girl, although known to history as St. Elizabeth of Hungary, would spend most of her life in Germany, where many would regard her as the greatest woman of the German Middle Ages. Life for little Elizabeth was far from easy. News soon arrived of her mother’s death amidst political turmoil back in Hungary, and in the high mountain castle of Wartburg, home of the counts of Thuringia, she was mocked and chided for her deep Christian devotion. But she had a champion who silenced her tormenters: the boy who was to marry her, the future Ludwig IV, landgrave of Thuringia. They were wed in 1221, when Elizabeth was fourteen and Ludwig twenty-one, and the next few years were probably the happiest of her life. They had three children, and Ludwig strongly supported her extensive charitable work among the poor. He used to hold her hand, it was said, as she said her nighttime prayers. When famine and plague struck during Ludwig’s absence in the service of the emperor, the landgravine Elizabeth led the relief work, selling castle furnishings to finance a hospital in the town of Eisenach. She also came under the influence of the Franciscans (see chapter 10), eventually joining their third order. This severity he imposed full force upon the young widow, demanding of her spiritual exercises that were harsh even by the standards of the mendicant orders. 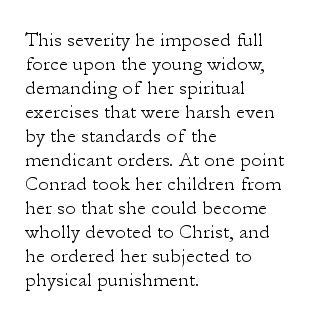 At one point Conrad took her children from her so that she could become wholly devoted to Christ, and he ordered her subjected to physical punishment. Elizabeth nevertheless persisted in her charities, spending her dower to build a Franciscan hospital. She had become a heroine to the poor by the time, in the fall of 1231, she died of sheer exhaustion at age twenty-four. Repeated reports of miraculous healing soon made her grave a major place of pilgrimage. A very different end awaited the relentless Conrad. Two years later, as chief inquisitor in Germany he formally accused Count Henry of Sayn of heresy and bizarre diabolical behavior. A court of the count’s peers acquitted him, and Master Conrad was murdered as he rode home from the trial with his entourage. When this news reached Rome, Pope Gregory IX received it as information. Notably, he did not call for an inquiry. All rights for this article on Elizabeth of Hungary are owned by the Society to Record and Explore Christian History (SEARCH). In accessing this page on Elizabeth of Hungary you agree to only download the content for your own personal non-commercial use.